Interested in sponsoring a Division or Class at our shows?? Information will be posted under the Summer Special Horse Show Tab in the Navigation Bar above for all show information regarding the August 3-4 show. IMPORTANT: Class List, Entry Forms, etc. are DIFFERENT from our regular shows!!!! RULE BOOK WAS LAST UPDATED JANUARY 11, 2019!!!!! Class List includes hunters, jumpers, equitation and derby classes! 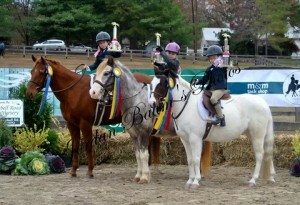 Friendly, schooling show environment with affordable classes! Must show at a minimum of 5 shows to be eligible for Year End Awards! To be eligible, each riders entry form MUST have the trainers name listed on entry form, if a trainers name isn’t listed, points will NOT be awarded. Trainer will receive 8 points for every class a rider wins, 4 points for every class a rider pins 2nd – 8th, and 1 point for every class a rider is entered in. Trainer must show at least 1 point collected at a minimum of 5 shows to qualify for a $500 CASH PRIZE! Votes will be taken at our October show and online. To be eligible a rider must compete in at least one class at 5 of the shows in the series. Every year we host an Awards Banquet to celebrate the achievements of our horses and riders! Details are announced annually, and the banquet is typically in January or February. For the 2018 Show Year, the banquet will be held on January 26, 2019 at Heather Hills Clubhouse in Garner. There will be two schooling areas available with jumps as well as a round pen to lunge in all day!!! Open to riders 12 years of age and under (as of Jan 1). Emphasis in this division will be on equitation, safety and suitability of horse/pony. Martingales, grazing reins, and other training equipment to keep naughty ponies behaving properly is permitted in all classes. Riders may only cross enter into the Walk Trot Pleasure classes. Year End Points follow the rider in this division. Open to riders 12 years of age and under (as of Jan 1). Emphasis in this division will be on equitation, safety and suitability of horse/pony. Martingales, grazing reins, and other training equipment to keep naughty ponies behaving properly is permitted in all classes. Riders may only cross enter into the Pleasure Division. Year End Points follow the rider in this division. Open to riders under 16 years of age (as of Jan 1). Emphasis in this division will be on equitation, safety and suitability of horse/pony. Riders may cross enter into the Pleasure Division, and hunter under saddle classes (Restricted, Schooling, Open). Year End Points follow the rider in this division. No Professionals! Open to riders 16 years of age and over (as of Jan 1). Emphasis in this division will be on equitation, safety and suitability of horse/pony. Riders may cross enter into the Pleasure Division, and hunter under saddle classes (Restricted, Schooling, Open). Year End Points follow the rider in this division. Open to all horses in their first two years of showing in hunters. This division is not intended for green riders please. It is intended for green horses, or horses that are new to showing in the hunters. Year End Champion (horse) must advance out of this division. May cross enter in the Green Hunter Division, Restricted Low Hunter Division, Pleasure Division, or any other flat classes. Year End Points follow the horse in this division. Open to all. Emphasis in this division will be on suitability as a Pleasure Mount. Hunter Hack will be asked to jump two crossrails in a line and work on the rail. Year End Points follow the horse in this division. Open to all ages young and old!! Must have ASTM/SEI approved helmet and be assisted by a ground person at all times. 10 and under riders may cross enter into Pre Mini Stirrup. Open to riders 10 years of age and under (as of Jan 1). Emphasis in this division will be on equitation, safety and suitability of horse/pony. Martingales, grazing reins, and other training equipment to keep naughty ponies behaving properly is permitted in all classes, unless otherwise specified by management. Each horse/rider must have a handler. Handlers will remain next to horse/rider throughout this class for added safety, although it is optional whether or not the horse is on a lead line. Riders will be asked to demonstrate the walk and the trot. Riders may cross enter into Leadline only. This Division is intended for those riders that are not yet ready to show independently, but have advanced past Leadline. Year End Points follow the rider in this division. Open to green horses in their first two years of showing that are not jumping higher than 2’. Courses will consist of full hunter type courses with gates, filler, and flower boxes/lines. Jumps will be 18″ and will NOT have oxers. Simple changes will not be penalized. Year End Points follow the horse in this division. Year End Champion must advance out. Green horses may only cross enter into the Baby Green Hunters, Restricted Low Hunters, Pleasure, hunter under saddles (Schooling and Open) and Equitation on the Flat. No professionals! All ages welcome. Courses will consist of full hunter type courses with gates, filler, and flower boxes/lines. Jumps will be 18” and will not have oxers. Simple changes will not be penalized. May cross enter into Schooling Hunter, Open Hunter, Equitation, Hunter Derby and any jumper classes. **A Baby Green or Green horse may cross enter into here, but may not cross enter Schooling, Open, Equitation Over Fences or Derby. Year End Points follow the horse in this division. Open to all. Courses will consist of full hunter type courses with gates, filler, oxers and flower boxes/lines. Jumps will be 2’ and will not have oxers. Simple changes will not be penalized. May cross enter into Restricted Low Hunter, Open Hunter, Equitation, Hunter Derby and any jumper classes. Year End Points follow the horse in this division. Open to all. You may jump a different height within the division at the same show. Courses will consist of full hunter type courses with gates, filler, oxers and flower boxes/lines. Jump heights offered: 2’3” and higher. All heights are judged together as one division. May cross enter into Restricted Low Hunter, Schooling Hunter, Equitation, Hunter Derby and any jumper classes. Year End Points follow the horse in this division. No professionals! Open to all riders. Additional testing may be required at the judge’s discretion. Year End Points follow the rider in this division. No professionals! Open to all ages. You may select what height to jump at each show. Courses will consist of full equitation type courses and may contain gates, filler, oxers and flower boxes/lines. There can also be a narrow/skinny fence, and a trot fence. At the judge’s discretion, further testing may be required including a flat phase. This class will be offered at all heights starting at 18” and higher, and all heights will be judged together. Year End Points follow the rider in this division. Top 10 riders in the points be invited to compete in Medal Finals at our October show. Medal Finals will consist of an Over Fences phase, a Flat phase and the top 4 riders after those two phases may be asked for additional testing. Derby will be offered at all heights starting at 18” and higher. Derby courses may include a skinny fence, trot fence, natural hunt field type obstacles (coup, log, and brush). Riders may be asked to dismount and mount, and/or lead their horses over an obstacle. A second jumping round over a modified course may be requested by the judge. Minimum of 6 entries for add-back money to pay out. 50% of entry fees will be paid out as follows: 1st – 35%, 2nd – 25%, 3rd– 20%, 4th – 10%, 5th – 5%, 6th – 5%. Entry fee $25.00 The top 10 horses in our Hunter Derby points standings (who have competed in the Hunter Derby at least 4 times throughout the season) will be eligible to compete in the FINALLY FARM HUNTER DERBY FINALS to be held at our October show. Year End Points follow the horse in this division. This class will not run with less than 3 entries. Crossrails. Horse/Rider combinations that compete in the Itty Bitty Jumpers are additionally eligible to compete in the 2’ Puddle Jumper Division and the Restricted Jumper Classic, Restricted Low Hunters, Schooling Hunters, Open Hunters, Equitation and Hunter Derby. May not compete in any other Jumper Classes. Year End Points follow the horse in this division. 2’ fences, no oxers. Horse/Rider combinations that compete in the Puddle Jumpers are additionally eligible to compete in the Itty Bitty Jumpers and the Restricted Jumper Classic (at 2’). May not compete in any other Jumper Classes. May cross enter into Restricted Low Hunters, Schooling Hunters, Open Hunters, Equitation and Hunter Derby. Year End Points follow the horse in this division. Jumper Classic will be offered at crossrails and 2’ without oxers. Only riders from the Itty Bitty Jumpers and the Puddle Jumpers are eligible. Entry fee $11.00 The top 10 horses in our Restricted Jumper Classic points standings (who have competed in the Restricted Jumper Classic at least 4 times throughout the season) will be eligible to compete in the FINALLY FARM RESTRICTED JUMPER CLASSIC FINALS to be held at our last show of the season. Entry Fee Finals $25.00 Year End Points follow the horse in this division. 2’ fences with oxers. Open to all. May contain combinations. May cross enter into Restricted Low Hunter, Schooling Hunter, Open Hunter, Equitation and Hunter Derby. Year End Points follow the horse in this division. Open to all. May contain combinations. May cross enter into Restricted Low Hunter, Schooling Hunter, Open Hunter, Equitation and Hunter Derby. Year End Points follow the horse in this division. Jumper Classic will be offered at all heights starting at 2’ with oxers and higher. Open to Beginner, Hopeful, Training, Schooling and Open Jumpers. Entry fee $11.00 The top 10 horses in our Jumper Classic points standings (who have competed in the Open Jumper Classic at least 4 times throughout the season) will be eligible to compete in the FINALLY FARM OPEN JUMPER CLASSIC FINALS to be held at our last show of the season. Entry Fee Finals $25.00 Year End Points follow the horse in this division.